Shotguns work differently compared to the standard rifles and handguns. A standard gun has a cartridge that’s made up of four components: the bullet case, its primer, propellant and the actual bullet. While this is applicable to most types of weaponry, shotguns would require two additional parts – the cap and the wad of cotton or paper that separates the shot from the actual powder. This means that if you are planning to start reloading and making your own shots on your own, it is important to not just think of those components, you also need to find the best shotshell reloader in the market. Why do you need a shotshell reloader? Well, the great thing about having one for your workshop is that you can control and ensure the quality of the shells that you will be using. You can also reload your own shells and save money on store-bought ones. And this is especially helpful if you know that you consume large quantities of shells on a weekly or monthly basis. Now, for those who are new to this, take note that it requires a great attention to detail, because compared to other cases which you can reload easily, you need to make sure that the shells that you make are tightly packed and that each one is safe, reliable and accurate. We have searched throughout the shotgun world to find 3 shotshell reloaders that you can choose from. Also, we have tested and reviewed each one to help you decide which reloader would work best for your needs. MEC Sizemaster 20 Ga Shotshell Reloader – this is a single-stage reloader press which allows the user to focus on a specific gauge and die. What is notable about this type of reloading press is that you can easily focus on each shell that you reload and make sure that each one meets your high standards of safety and accuracy. Also, this type of reloader can limit you when it comes to yield because it can only do one type of shell at a time. However, if you do not need a lot of shotgun shells on a regular basis or you only use a single type of shot gun, then its capacity will suit you well. MEC Mayville Progressive Shotshell Reloader – made for high-volume reloading, this is a great press or reloader for people who are into heavy hunting or those who require larger number of shells in a given period of time. The MEC Mayville is a progressive reloader that allows you to reload as much as 300 shells per hour. Although it has a high volume capacity, you may want to pay close attention to the details of every shell because it the machine operates really fast and there is tendency that the quality of some of the shells may be compromised. 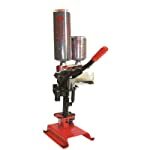 Lee Precision Shotshell Reloading Press – a top-notch progressive reloader, it is a great machine to reload a large amount of shotgun shells in a short amount of time. You can actually make 100 shells in under an hour with this press, which is a relatively good yield. Lee Precision Shotshell Reloading Press – the Lee Precision is so easy to use; it instantly became one of our favorites. It doesn’t need a lot of adjustments to operate in between shells, which saves you more time. You can even set everything up and walk away. And despite how fast it works, the quality of each shell will never be compromised. MEC Sizemaster 20 Ga Shotshell Reloader – this is very easy to use, considering that it performs similar to a completely manual or a traditional press. The crimp is camera operated, which makes it really easy for even a newbie crimp and expertly close every single shell. It also remembers the proper reloading sequence that you use, which prevents powder spillage and over filling the shells. MEC Mayville Progressive Shotshell Reloader – it features automatic indexing and shell ejection for ease of use. The MEC Mayville 9000Ga doesn’t require a lot of supervision because it will do its thing with precision. You also do not need to make adjustments often. Each shell passes through every reloading stage as long as the handle is returned to its up-right position. Needless to say, this is a very user-friendly reloader. MEC Mayville Progressive Shotshell Reloader – the MEC Mayville is designed for high-volume reloading, which aims to help you save more time in producing large quantities of shells for your upcoming hunting trip or if you simply need enough ammo for target practice. Its Auto-Dex feature will make sure that the shells pass every reloading stage accurately and precisely. And every finished shell will be carefully ejected. It is also made to perform at factory speed, which we really liked. But do not be fooled by its high-speed performance, because MEC built this for heavy-duty reloading, so you don’t need to worry about breakdowns. 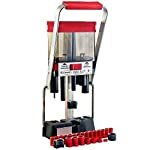 Lee Precision Shotshell Reloading Press – it loads both a 3 inch and 2 ¾ inch 12-gauge shotgun shells perfect for 24-shot and powder bushings. The press is designed to make it easier, even for newbies to operate. With the Lee Precision Shotshell reloading press, you can reload standard shells, trap shells and slugs, making it a really versatile machine to have in your gun-workshop. The handle is also designed for easy handling and transfer. People may say that it doesn’t produce as much, but quality is what this shotshell reloading press is built for. The shells come out pristine and well pressed just like in factories, or even better! MEC Sizemaster 20 Ga Shotshell Reloader – the MEC Sizemaster is designed to perform and produce high quality factory shotgun shells. It has a flip-top measure to ensure that the powder and even the shells can be filled without causing any spills at all. We also liked it adjustable rammer for the perfect amount of pressure when inserting the wad. It is equipped with a Spindex2 feature to rotate and realign the shells automatically, just like what they do in factories. This comes with a change bar for reloading trap and even light hunting shotgun shells. It is also designed to produce six and eight point crimps. It is also built to last to guarantee that you will be able to produce top-notch shotgun shells for many years. The ease of use and set-up is what sold us on the Lee Precision Shotshell Reloading Press. It has exceeded our expectations and we are glad to say that it is the best shotshell reloader that we have tested. It may not produce more shot shells in an hour, but the press is really accurate for a small amount of money. Now, if you really are into producing large batches of shells, then the MEC Mayville Progressive Shotshell Reloader is something worth considering. It offers greater amounts of shells and is also reliable and durable at the same time. None of these 3 reloaders are near the best shotshell reloaders. As an avid trapshooter and reloader for 35 plus years if I ask all my fellow trapshooters, not a single one of them will have any of these reloaders listed. NONE! A Mec 9000 will be probably the most popular, but even that isn’t the best. The best ones will cost over $1,000.